The colder months are rolling in and all I can think of is sitting by a cozy warm fire. 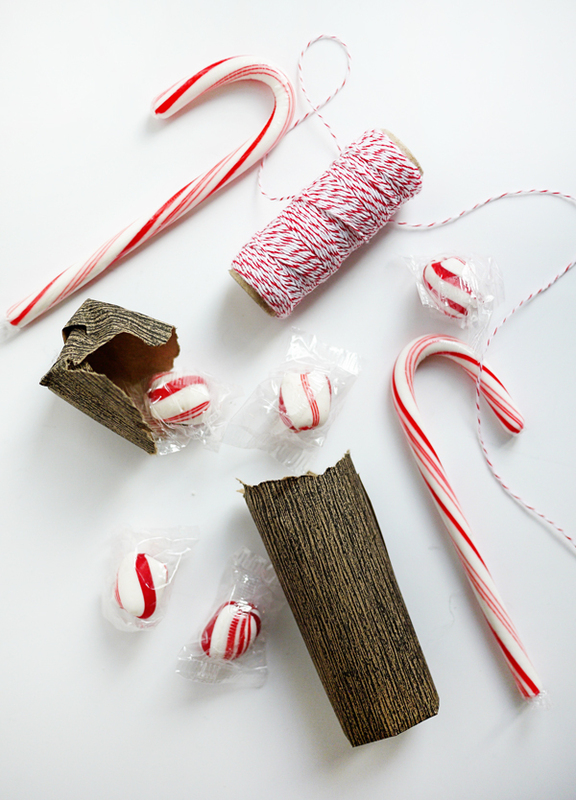 With the holidays approaching there are a million reasons to make these cute log bundle candy poppers for your friends and family. Fill them with any seasonal sweat treat and they will be a perfect thing to tear into while getting toasty by a fire. 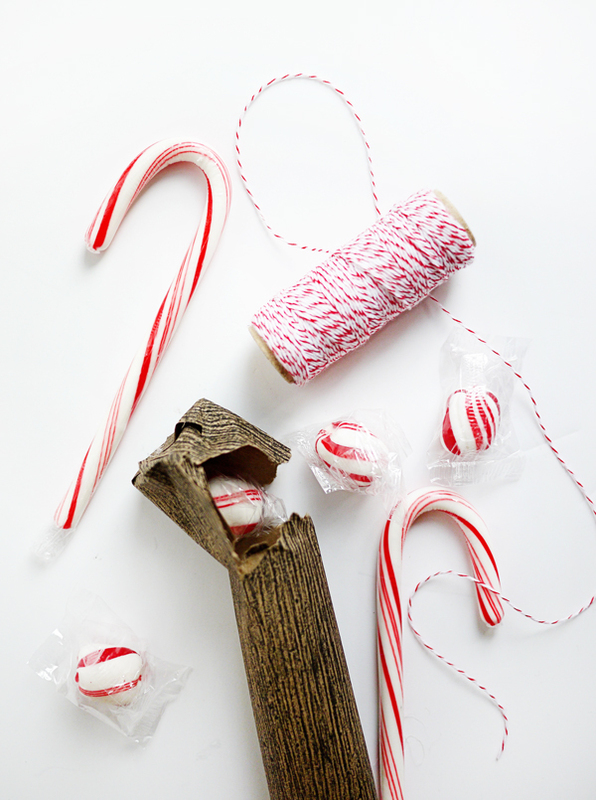 Materials: Printable Log Bundle Candy Poppers, 9 x 12 kraft paper (8.5 x 11 works too), scissors, hole punch, double-sided tape, glue gun, bakers twine. 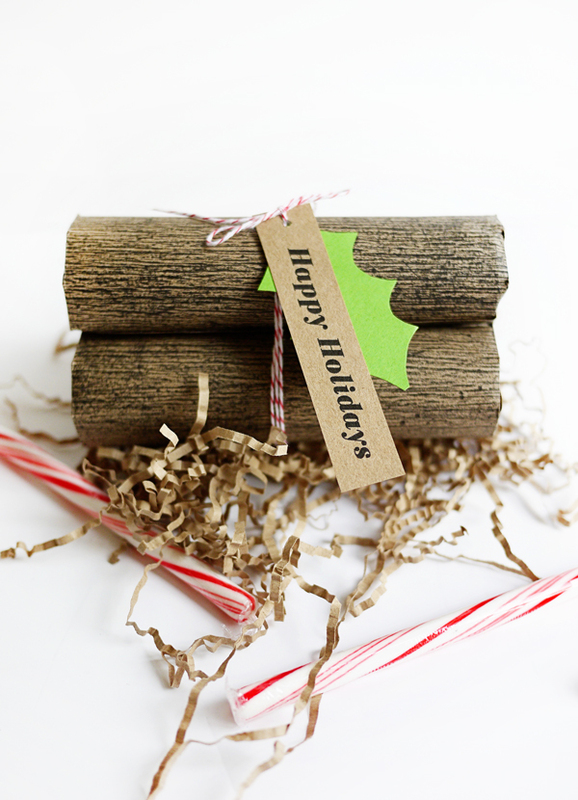 Step 1: Print out the Printable Log Bundle Candy Poppers on a 9 x 12 kraft paper. Step 2: Follow the dotted fold lines printed on the template and fold the paper on the top and bottom of log. 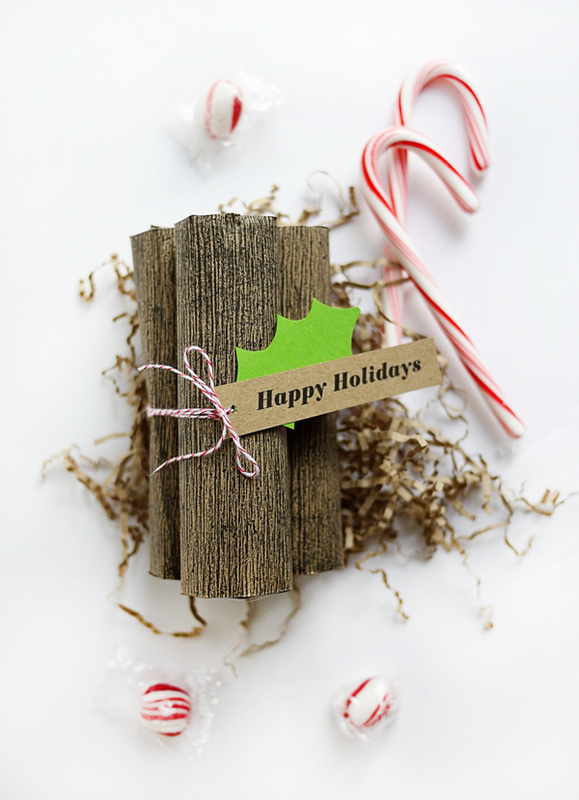 Step 3: Cut out the Happy Holidays tags and the log piece but leave the top & bottom areas with the crop marks. Step 4: Cut a notch through each crop mark to the fold of the paper (see photo for detail). When notches have been cut on both sides of the log, cut off excess paper. Step 5: Line the inside of one side of the log with double sided tape. 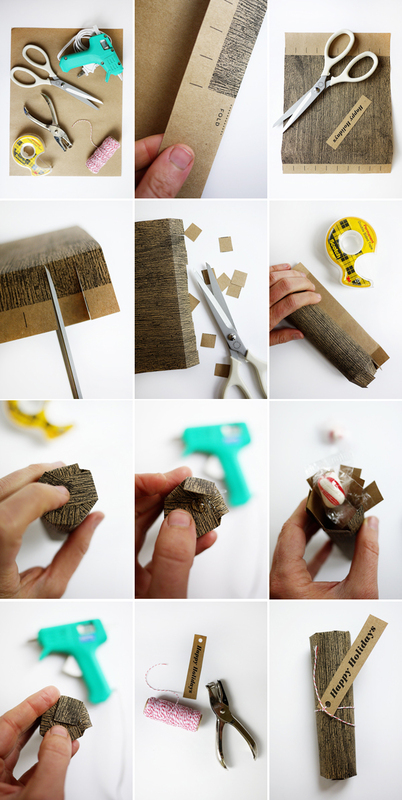 Roll the paper to create the log shape and secure with your finger. You can make the log as small or large as you please. Step 6: Using the glue gun, start glueing each tab on top of one another to close the end (see photo for detail). Let the first side dry. 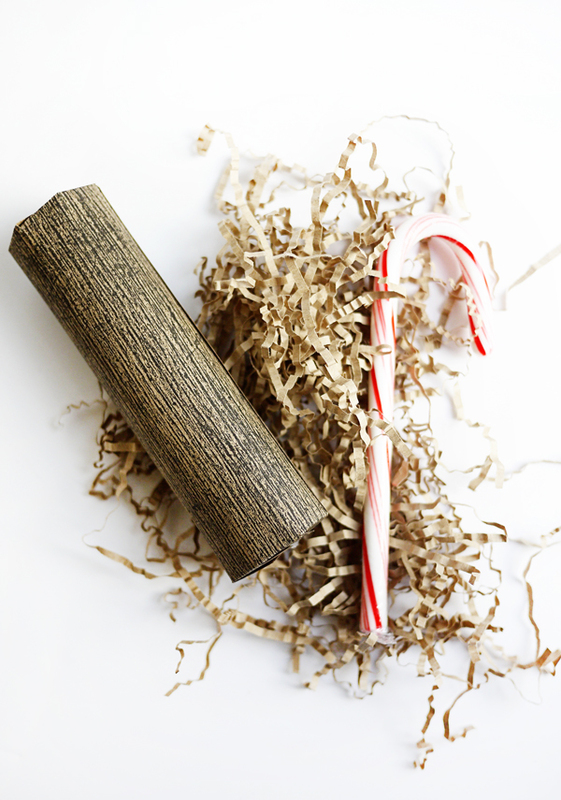 Step 7: Turn the log over and fill with any fun seasonal candy or treat. Repeat the Step 6 to seal the treats in the log. Step 8: To create the bundle, you will have to print out 2 more logs and repeat the previous steps. Step 9: Use the hole punch to make a hole in the tag. 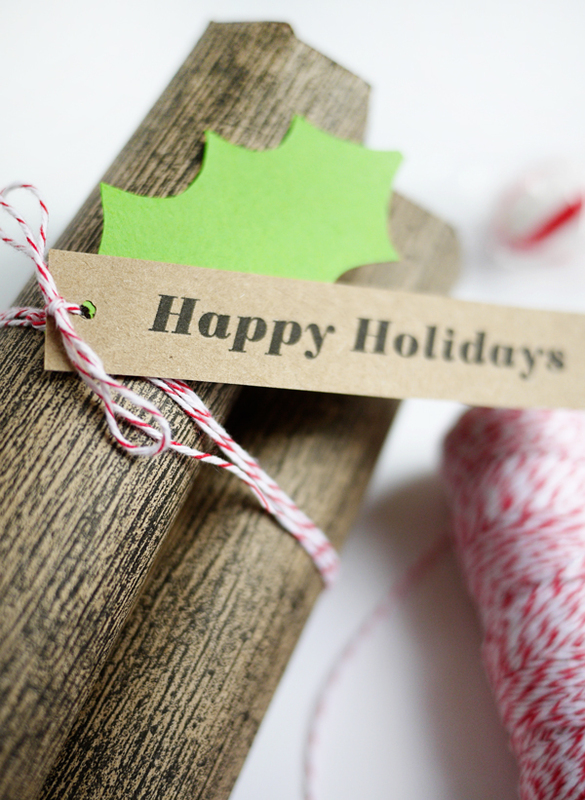 Tie the logs & tag together with some bakers twine. Step 10: Give a bundle to a friend and watch them tear into their holiday treat! LOVE LOVE LOVE! I love all things printable..but this is just too cute!! Thank you for sharing! I can’t wait to make some up and fill with goodies! Those are sooo cute, I totally love them! These are super cute! What an awesome idea!